In Race Card, which Siv describes as a �racially active� production, he pokes fun at the wacky truths and quirks of the colourful people of South Africa. Ngesi has co-written the show with Director Brent Palmer, successfully adapting The Racist's Guide To The People Of South Africa for the stage, while retaining its hilarity and satirical essence, and infusing the show with Siv�s comical personal stories and observations. At first read Siv knew the book would make for a successful show - which is exactly what it�s become; a comedy that is able to reach a diverse range of South Africans, creating connections amongst South Africans and making them realise their oneness. Sivuyile �Siv� Ngesi is a 26 year-old comedian and actor born in the township of Gugulethu, Cape Town. At the age of nine Siv toured Asia with Les Miserables in the coveted role of Gavroshe. Since then he has landed roles in films such as World Unseen, Zeenon Z3 , Schweitzer , Invictus and Long Walk To Freedom. He first made a name for himself in the popular SABC 1 television programmer Khululeka, The Adventures of Sinbad, Double Shift and Interrogation Room. Siv was also one of the leads in M-Net�s League Of Glory. Currently you can catch him on Mzanzi Magic in a show called S.I.E.S and the international series Strike Back. His best credit to date must be his scenes with Keifer Sutherland in the hit American TV series, 24. 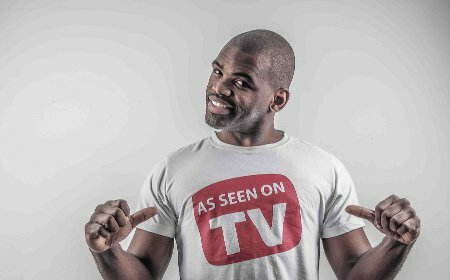 Siv�s theatre experience includes top class productions such as Sizwe Banzi is Dead, The Island , Butlers and Brandy and more recently his stand-up comedy show Dekaf, that he co-wrote with the LA based comedian David Newton. The Racist's Guide To The People Of South Africa has been described as a politically incorrect, thoroughly unscientific and exceptionally funny satirical "guidebook" that identifies � and makes light hearted fun of � the people of the Rainbow Nation. It�s written for Foreigners and for all the South Africans it parodies, noting from the start that "Blacks", "English Whites", "Afrikaners", "Coloureds", "Indians" and "Miscellaneous" are the primary races to be encountered in the land. Kilpatrick says, �When I was busy writing The Racist's Guide I remember thinking to myself, 'Wouldn't it be awesome if a comedian turned my book into a comedy show.' Six months later (shortly after the book had hit the shelves) I received a phone call from some guy, completely out of the blue, saying "Hi! I'm a comedian. I just read your book. I want to turn it into a comedy show!" Little did I know this was not just any comedian, this was Siv Ngesi - a true master of comedy in South Africa. Looking back, I couldn't have asked for more and it is a great privilege and joy to have such a talented and hysterical performer take the book, turn it into a show and then masterfully make it come alive in front of an audience. And even though I know what's coming, he still makes me laugh every time!" The national tour of Race Card starts at the Baxter Golden Arrow Studio Theatre in Cape Town from 1 to 13 October, then moves to Port Elizabeth, East London, Johannesburg and Durban. Performances at the Baxter run Monday to Saturday at 8:15pm and tickets cost R80 via Computicket.